The Webmention spec includes the possibility of creating a status page if processing a webmention asynchronously. This enables a sender to have a way to check on the status of whether their webmention is verified. If a receiver returns a status page, the spec says to respond with HTTP 201 and a Location header, e.g. The contents and format of this status page are not specified, as there were no consuming cases implemented at the time of standardization. The goal of the status page is to give senders a way to know whether their webmention sending was successful or why it failed. People have implemented a variety of different ways this information is returned at the status URL. 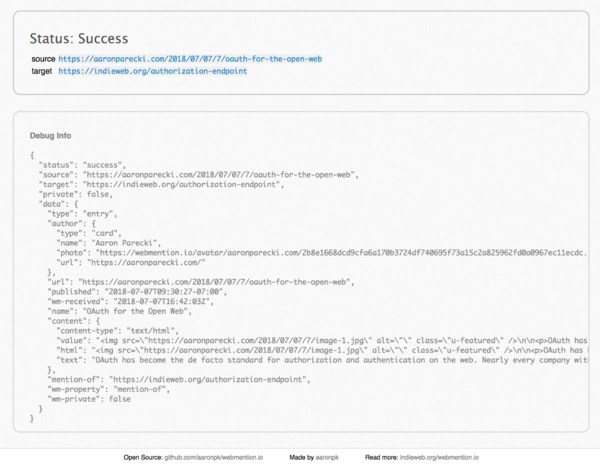 webmention.io returns status pages that return either JSON or HTML depending on the Accept header. 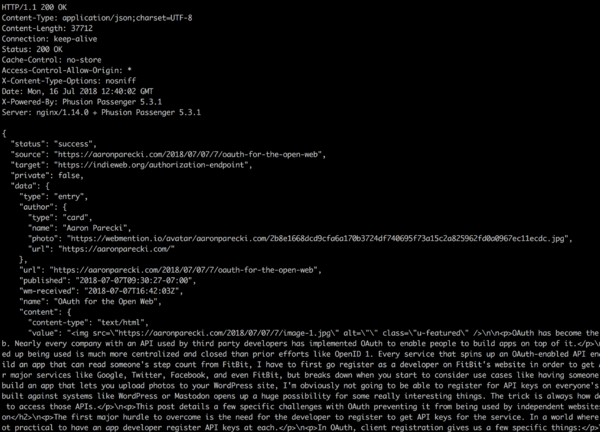 If the Accept header includes application/json, then the JSON in the HTML page's "Debug info" is returned instead. This includes a property "status" set to "success" when successful, or one of the error codes above, as well as the source and target URLs, and the XRay-parsed result of the source URL to aid in debugging. When verifying a webmention by checking the source site, include an X-Forwarded-For HTTP header in your request, with the value set to the IP address of the client that notified your server of the alleged webmention. where $sender_ip is the IP address of the incoming request that informed you of the webmention and $source is the source page of the alleged webmention. Then check the response to see whether a link to $target is present. Note: WordPress is using X-Pingback-Forwarded-For to mitigate abuse of pingbacks. And IETF is also in process of standardizing a Forwarded header (with a more detailed semantics). If someone feels strongly, we could pick one of those or mint something new, but in the meantime, use X-Forwarded-For. Asynchronous status polling could be achieved via the webmention receiver returning a LINK header with rel=status with a URL for querying the status of a specific pending webmention request. Then the sending of the webmention could poll that URL for updates on the status of that particular webmention. In order to distinguish between the layers of a request to the status page and the actual current status of the webmention, the page could return an additional header to explain that status of the webmention processing. This could be the same code that would have been returned if the webmention were just submitted. This would say that the webmention is still in the state of "accepted" but has not processed yet. This also leaves the page body open to any formatting for the user's view. Asynchronous status notification could be achieved by using a webhook in the initial webmention request. to the webmention POST request. Webmention receivers should optionally support the "callback" parameter by calling it back (doing an HTTP POST to it) upon completion of processing of the webmention, with a "status" query parameter indicating the outcome of webmention processing. See "More status codes" below for possible values for that parameter. To make webmentions more useful, it would be great if there was some way to have them propagate as notifications to whatever devices the user has setup to receive such notifications. See: homepage: webmention to homepage. Good retry logic can be hard, regardless of what you're doing, and webmentions are no exception. 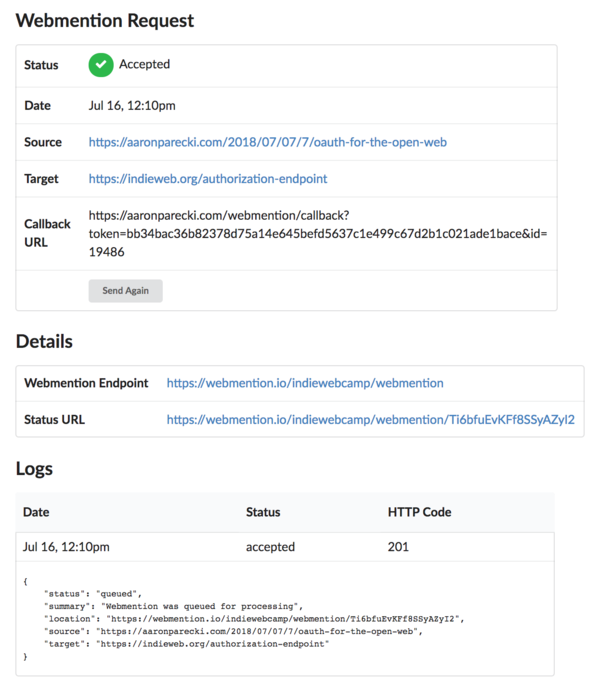 Here are some current practices we use to retry HTTP fetches for webmention endpoint discovery, sending webmentions, and fetching source pages to check backlinks. Bridgy gives up immediately on 4xx errors and DNS lookup failures. On other errors (mostly 5xx and connection failures), it retries 30s later, backs off exponentially down to once an hour, and gives up after 3d. If a single sender is sending to many requests, HTTP 429 (Too Many Requests) seems like the apropriate response. In other cases, HTTP 503 (Service Unavailable) can be used to signal temporary failure. Both allow a Retry-After header to give a hint when new submissions are accepted. The webmention specification currently doesn't mention how responses other than 400 & 500 should be treated. For senders that are directly triggered by a user that can not retry later automatically, it might make sense to displays those temporary errors differently to the user than more permanent errors (like a missing WM endpoint), prompting them to retry manually later. Pages that do not support webmentions should not advertise an endpoint, even if the domain in general does. Webmention spam is not (at time of writing) really a problem; it'd be nice to keep it that way. A proposal: add a hashcash-like "proof of work" to a webmention request. In essence, this is a calculation which takes a little time to do; not enough to impact an individual sender, but enough to make large-scale webmention-sending (i.e., spam) problematic. Proposed approach (suggestions from crypto people are welcome!) In addition to source=http://source/article&target=http://target/whatever POST parameters to the webmention endpoint, also pass two new parameters: time=1417292519&nonce=5684712. The time parameter is UTC epoch time (seconds since 1970), and the nonce is calculated such that sha256(target + "-" + time + "-" + nonce).hexdigest() startswith "000000". The number of zeroes required can be varied before specifying this approach to "tune" the difficulty of creating a nonce; the above (6 zeroes) takes some seconds on a reasonably modern machine. A webmention endpoint then checks that sha256(target + "-" + time_parameter + "-" + nonce).hexdigest() really does start with "000000", and that time is not too long ago (to prevent replay attacks; "not too long ago" is intentionally vague here because one must consider clock drift and so on). Possible alternative: set up hashcash-for-vouches.com where one submits the proof of work to h-f-c.com and if it verifies, h-f-c then vouches for you as per Vouch. What should then happen is that if people generally agree that h-f-c is requiring a proper proof-of-work, everyone whitelists it. So it's all done on the back of Vouch, but it doesn't have Vouch's clique problem. A working implementation of this is at Hash for Vouch and described in detail there and on kryogenix.org. Hashcash for Vouches seems like overengineering. Why not just attach a hashcash to the webmention itself? If you were sending a webmention from http://example.org/a to http://another.example.org/b, you'd take the target URL, calculate a hashcash for that URL, then send that as an extra parameter in the webmention. If you get a hashcashed webmention and you don't support hashcash, simply ignore it. Several individuals have implemented webmention status pages, but what about a permalink for the webmention itself? If you receive a webmention from a web page that requires authentication to access it, the normal webmention verification process will fail. What is the best way to have the webmention endpoint authenticate as the receiver's website to be able to fetch the private page? caching implementations will likely send Webmentions for URLs that don't accept them, receiving HTTP 400 responses and creating "unnecessary" load on both sides. They should not use high error rates as indication that the receiver is defective. implementations should not cache negative discovery results -> just because one page on a domain does not support WMs and doesn't announce an endpoint doesn't mean there aren't other pages doing so. If an implementation caches the endpoint and receives a 400 error when sending to the cached endpoint, it SHOULD NOT treat that as a failure, and SHOULD go re-discover the endpoint. This allows senders to use cached endpoints for receivers that don't implement CSRF protection, and will not fail for those that do. Tantek Çelik, Sandro Hawke and I ( Shane Becker) discussed what to store (irrespective of how one stores data, i.e. database, html+mf2, etc) one night after IndieWeb Summit 2016. This is what we came up with. Then you should process that blob from the source. If you can learn additional information about the source's post type, you should store that (rsvp, photo, note, etc). Then process the blob for type specific properties. Even after processing the source blob and saving parsed properties, you should keep the source blob in case you want or need to process it again in the future with some new understanding or new requirements. Webmention senders may wish to keep track of the status of webmentions they send. What do people think about receiving a webmention for a POSSE copy? E.g. You post to your site, you posse to twitter, someone @-replies on twitter, and then they put that reply permalink into the "send a webmention" form on your original post permalink? Kind of a semi manual backfeed without Bridgy that is. As this doesn't affect existing compliant implementations, it should be backward compatible. It should also be an extension that sites can implement immediately and try experimenting with. James Snell brings up a suggestion to use the HTTP LINK verb to send the webmention notification. This would remove the need to first make the discovery request to find the webmention endpoint, since it could immediately send the LINK request to the URL itself. It's way less likely to actually get adoption using the LINK verb. The discovery step adds an opportunity to add a layer of indirection, which lets us separate the server that handles the webmention. While discovery is an extra step, but at the same time it provides a lot of benefits. For example, it wouldn't be possible to have a static HTML site handle the HTTP LINK request, whereas it could delegate to a webmention service by using the <link> tag. Additionally, some hosting environments may not provide a way to handle the LINK request where a normal POST would work instead. Because of the benefits and flexibility the discovery step adds, we need to stick with it and can't use the LINK verb as cool as that might be. Webmention, like Pingback, is a vulnerable vector for DDOS attacks. See DDOS for more discussion and proposed solutions. Third party visitor tracking (or possible exploit) via nocache icons. See  for details. Known implements a fix for this where icons are locally saved as of September 7, 2014. Ben is interested in other approaches. Not specifying a required response format and/or structures of the response formats is problematic as a client can never be sure they’ll be able to read the response. De-duplication (AKA de-duping deduping): replies and other responses are often duplicated in different places, e.g. via backfeed of POSSEd replies by Bridgy. Ideally, recipients should try to de-dupe webmention sources, preferring an original post. See: deduplication: How to deduplicate responses for more. use it instead of the source URL. thus: if/when your post receives Bridgy webmentions of POSSE copies of replies, you can find, retrieve, and display the original replies instead (i.e. treat it as if you received a webmention for the original). if you also receive a webmention for the original later (or before), you merely treat it as an update webmention using your existing update handling code path. mitigation: webmention receivers should look for a backlink in the first h-entry on a given source page only. rel=webmention should be added to the HTML5 rel registry (supercedes/obsoletes IETF/IANA 'Web Linking'). Does it make sense to allow rel=webmention on anchor tags in addition to link tags? Similarly, in an asynchronous interaction, the callback webhook should include a "status" URL query parameter with the status codes noted above. This page was last edited on 16 July 2018, at 05:58.